So dearest reader, do you remember Chance #1? It was quite a while ago now but for those who require a memory jogger then you’ll recall that I solved this square’s problem by buying a lottery ticket and visiting Camelot’s offices…………………and then going on to lose my season ticket. Remember? Ah those happy sunny carefree days! Anyway it’s now time for the second Chance square and this led to a great deal of head-scratching to decide where to visit. Once again the ideas of throwing darts at a tube map or rolling a dice came to the fore and I even sent out an email plea to the constant tourers for suggestions of where to go and then we’d pull a selection from a hat but with only two suggestions there didn’t seem to be the point………..and no-one had a hat anyway. 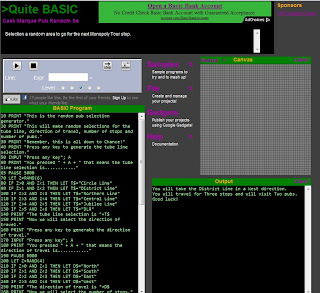 Then, whilst surfing around the net, I stumbled upon an on-line BASIC programming environment called Quite BASIC. 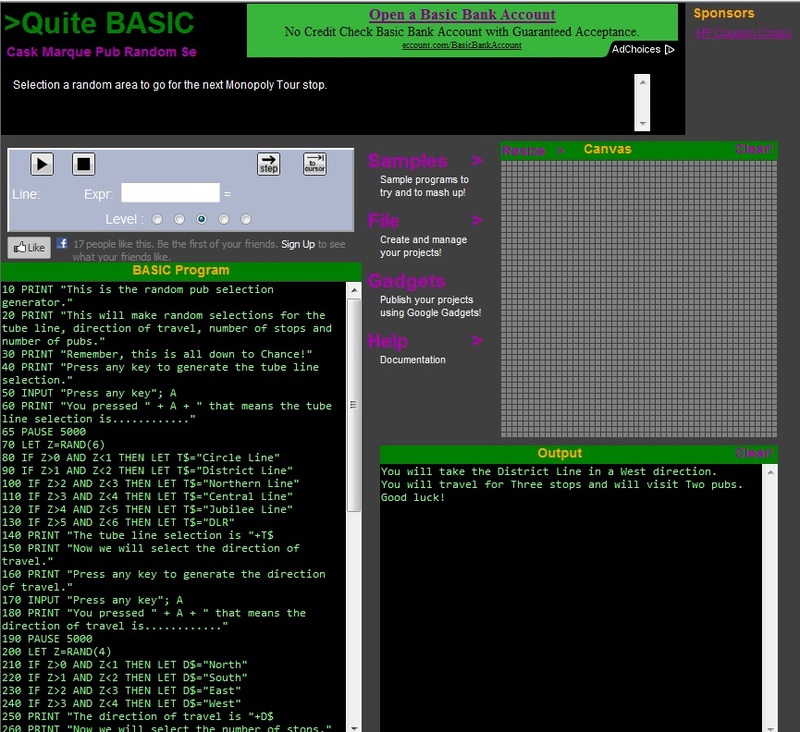 Now hands up, who remembers BASIC? 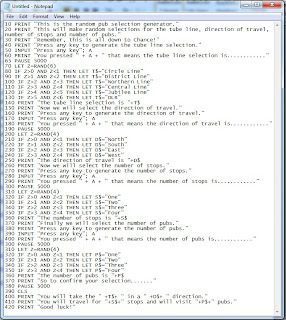 Anyone who was brought up in the classic era of ZX Spectrums, BBC Micros or Commodore 64s will remember this very “basic” programming language like yesterday. I cut my computing teeth on the awesome AcornElectron, and before you all take the mickey just remember this far outlasted all those other models I’d previously mentioned, and spent many a happy afternoon faithfully typing in lines and lines of BASIC code from the latest ElectronUser magazine. 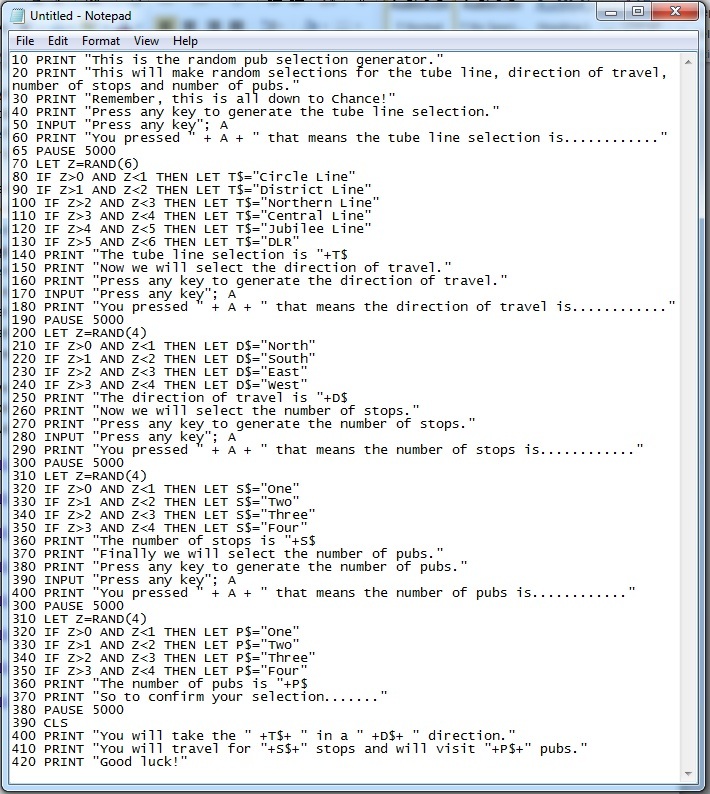 So, whilst I’d love to boast that quick as a flash I’d created a random pub generating location program, it was more like quick as a stumbling pensioner I’d created a random pub location generating program. 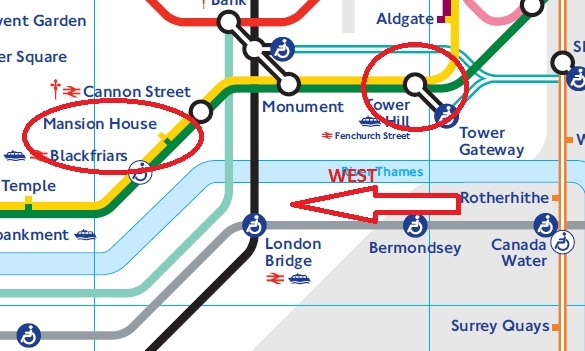 Now I won’t bore those less technical with the ins and outs of the program but basically it randomly chooses a tube line, a direction, the number of stops and the number of pubs to be covered. We obviously needed a glamorous assistant to press the buttons to do the selection and fitting the bill with plenty to spare is the lovely Chrissie, every IT team’s favourite administrator. Pressing the button as only she can the random journey generator conjured up the following combination. Debbie McGee, eat your heart out! The lovely Chrissie makes the prediction. 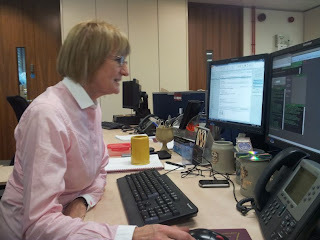 Note BGC's colletion of Steins on his desk! The predictor's prediction brought to life. So a quick referral to the Tube Map and the Cask Marque website revealed that we would be travelling to Mansion House and there was a Cask Marque accredited O’Neills just round the corner from the tube station. The other nearest pub from the station was the Green Man in Poultry but Aussie Pete and I had already visited this basement pub as part of Cask Ale Week when we were on a lunchtime pub frenzy to get the special T-Shirt, so casting the net further afield the next pub was the Ye Olde Watling (in Watling Street). But threatening to derail the random prediction was the fact that almost next door to the Ye Olde Watling was the Williamson’s Tavern, which (and here we go again pub fact fans) holds the oldest excise licence in the City of London – it was also a residence for the Lord Mayors of London and William III and Mary dined there – Surely we couldn’t miss this pub? It was a cold blustery and pretty damn miserable Friday night which saw the faithful tourers (Aussie Pete, Spiky haired Ed, Buddy Rob – with Charlie to follow) step out from the offices and immediately defy the random predicting program by electing to walk to the first pub rather than jump on the tube. 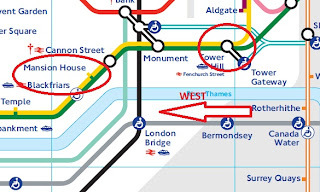 It was only a brief 15 minute walk down Great Tower Street and onto Cannon Street that saw us into the first pub and with Buddy Rob announcing that there were delays on the District Line it would seem bending the rules had been a wise thing to do. 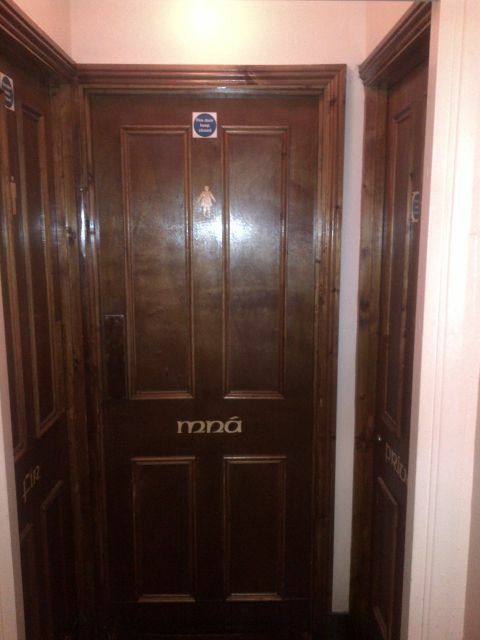 I was initially very surprised to see an O’Neills pub with Cask Marque accreditation in the first place. These “Oirish” themed pubs seem awfully dated now with a real whiff of everything that was bad about the 90’s in abundance. From the mosaic tiled “Fáilte” on the doorstep, to the row upon row of Guinness taps everything screamed no Real Ale here. I did spot one hand pump with the very unexciting Doom Bar on sale so determined to try to enjoy “the craic” I ordered pints of Smithwicks Irish Bitter for Aussie Pete and myself, Ed went with a Coors Light (got to watch his figure after all) and Buddy Rob went for………yep, you go it! 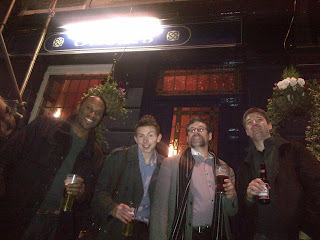 Friday nights obviously mean rammed pub nights so we escaped outside to try to find some breathing room and were soon joined by an ex-work colleague of Aussie Pete’s, Conrad who with obviously nothing better to do on a Friday night had elected to join the tour. I went back into the melee that was the queue for the bar and after ordering Conrad’s pint asked the most barmaidy looking barmaid in the world whether they did indeed have a Cask Marque certificate. “To be sure, I’ve only been here 2 days” she liltingly replied proving that whilst 90% of the pub might be fake Irish she was at least the real deal. Unfortunately neither she nor her colleague knew anything about the certificate, or Cask Marque at all if I’m to be honest. A visit to the loos just before we left was quite amusing as the pub had decided to use the Irish for “male” and “female” on the toilet doors. Now who would have guessed that the Irish for “male” starts with an F (it’s Fir) and “female” starts with an M (Mna) and who would have also guessed that your brain only seems to read the first letter of the word and who would have guessed that she’d be so furious………..well luckily it didn’t go that far but it could have. 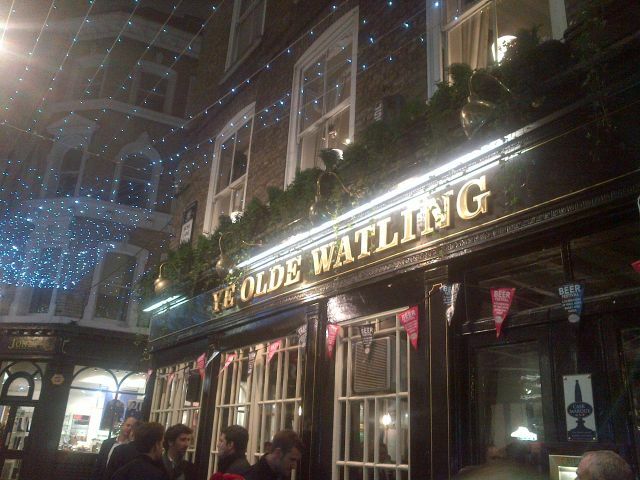 A quick jog across Queen Victoria Street saw us into Watling Street and the packed rafters of Ye Olde Watling and as Ed correctly said, a pub with “ye” in the name is going to be good. First thing that hit us was the very Christmassy scent of spiced mulled wine and the second thing was a large group of young guys all dressed in awful Xmas jumpers and sporting even worse Movember moustaches. Ye Olde Watling - Note Cask Marque plaque in foreground. Charlie now joined us (you missed nothing at O’Neills) and was just in time for pints of Ruby Mild (in cracking form) bottle of Heineken for Buddy Rob and pint of Blue Moon for Ed. The unframed certificate was wafting around behind the bar and the enthusiastic and attentive bar staff (seriously, there were hundreds of them and all seem genuinely willing and wanting to help) were glad to pass it across to be scanned. The pub, out of the Nicholson’s stable, is a cracking little place and unfortunately it’s the “little” which was the downfall for us, although we found respite from the crowds outside the patter of raindrops saw us only have a single pint before dashing just across the road to the Williamson’s Tavern and the breaking of the second of the predictor’s rules. Although the Williamson’s Tavern boasts the colourful and interesting history I reported earlier the back alley way outside doesn’t match the rather uninteresting ad boring inside. Again, wrestling through the crush to the bar it was another bottle of Heineken for Buddy Rob (Heiney Rob?) Veltins Lager for Ed and Conrad and three pints of something called Vicious for Charlie, Pete and me. Pump clips at Williamson's Tavern. 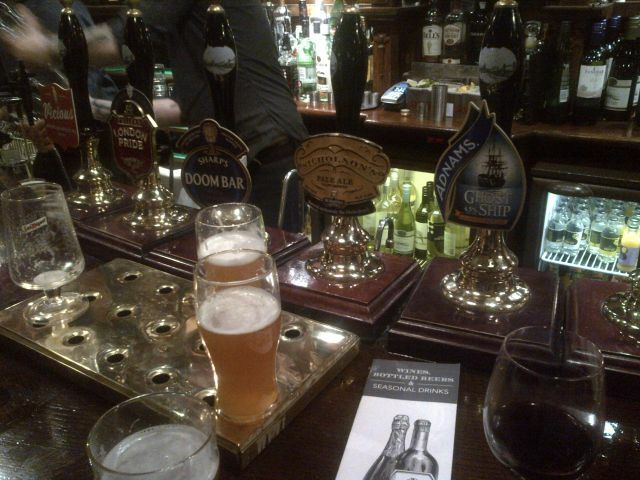 Vicious pump clip furthest left. Unfinished Vicious in foreground. The pump clip said it was an American Wheat IPA but to our English (and Aussie) taste buds it was pretty awful. Now I like wheat beer and I also like IPA but mixing them together just didn’t work for me or the other two and saw Charlie digging his hand into his pocket to buy pints of Ghost Ship for him and Pete and a bottle of proper Bud for me (Buddy BGC?). Williamson’s Tavern, another Nicholson’s, could have done with half the staff from Ye Olde Watling as there seemed to only be two very overworked chaps on bar duty. Luckily the certificate was hung on the wall in such a position that we didn’t require their help and distraction from their thankless task of serving the hoards. Again it was the crush that beat us and fighting our way to the exit saw a quick leap up Queen Street to the Golden Fleece, a Greene King pub which again Aussie Pete and I had already scanned on Cask Ale Week but slightly larger size gave us some much needed breathing room. 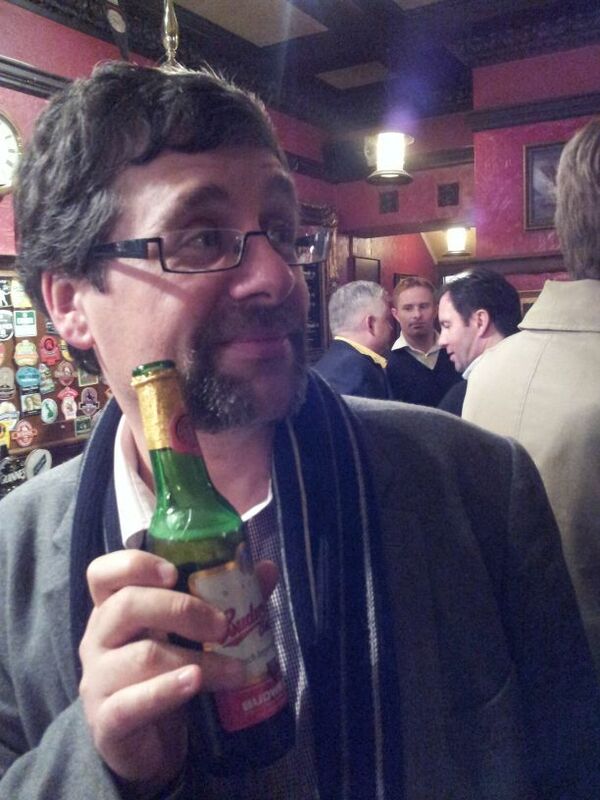 I remember pints of St Edmunds Ale and slightly more worryingly remember Aussie Pete trying to kiss me (?) but most of all I remember Monika and Adriana, the poor young Polish barmaids who had the misfortune to be on duty when the tour was in town. I took a shine to Monika’s fringe and with Ed turning on the charm to ascertain the poor thing was only 20 I probably scared her to death by handing out BGC business cards and explaining how they would star in the next episode of the blog. When Monika appeared in her coat and I offered to walk her to the tube, she fled…………………a wise move in the circumstances. Moustace Advice = No-one enjoys kissing a moustache. No-one. Language Advice = Przepraszam, nie chciałem cię przestraszyć.